Nelson here, channeling Gardner for another round of the Bremerton Beat’s ‘On Notice’ list. I would have left it to Steve to bring back the board and fulfill the reader call to poke Port Orchard and anything else that needs watching these days. But a story I saw this afternoon at the nytimes.com — ‘Obama put the country’s mayors “on notice”‘ — was a sign that this needed to happen. Now. 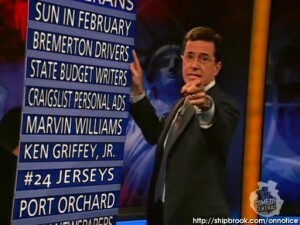 Of course, the list doesn’t go without a little explanation. The first two are on notice because, well, I hate to sound ungrateful, but as a Pacific Northwest native I’m a little thrown off by how much it hasn’t rained this February. Maybe I have too much Vitamin D flowing through the epidermis, makes me jumpy. In any case, when I saw two different convertibles driving top-down in downtown Bremerton this afternoon it felt a little early for the Seattle summer. Then there are the state budget writers, who announced this week a further drop in forecasted revenue, and next week will dig into where federal stimulus money fits into their budget. That’s something to keep an eye on. Hopefully that’s watched as closely as local cops seem to have eyed Craigslist, where a sting that started on the website’s personals section and ended with prostitution arrests (including, yes, a Bremerton woman) at a Bainbridge hotel. Marvin we’re watching to see how he represents Bremerton High as the school’s first jersey retiree, and Griffey because everybody has their eye on him as he returns to SafeCo. Especially all those so desperate for a good sports feeling that they rushed out Thursday to plunk down $230 and replace the #24 jersey mom threw out in 2000. If one of those convertibles was a 2 seater had an 8 year old boy in the passenger seat (with booster seat and airbag off) then that was me! Heck, what do you think the heater is for? Port Orchard, is well Port Orchard. But have you noticed lately that Poulsbo has been doing some catching up in the bizarre and unexplained story category? 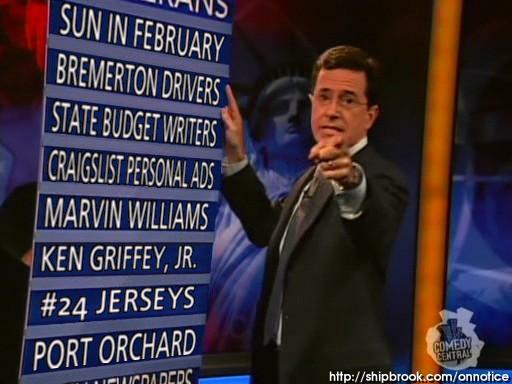 You missed a really big one for the On Notice Board though….you forgot to put the Bremerton School Board on there. Come on, you know they deserve it. Maybe next time.